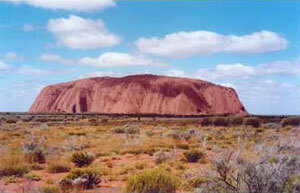 There’s no need to compromise on comfort and style when you take a journey into the heart of the Australian outback. Central Australia offers a superb range of quality accommodation and touring options that will transform any holiday into a magical and memorable journey. Grab your partner or get a group of friends together and revel in a unique outback journey to the Northern Territory that will deliver splendid experiences and sensual pleasures, enhanced by stunning scenery and friendly locals. For a truly special experience, indulge yourself at the newly opened Longitude 131°, a private resort nestled amid the ancient red sand dunes overlooking Uluru/Ayers Rock, Australia’s famous cultural and geological icon. Winner of the prestigious US Opal Awards Best New Australian Product and the UK Sunday Times Best New Wilderness Hotel Award, Longitude 131° is genuine luxury personified where guests are offered unprecedented solitude and serenity. There are only 15 individual luxury tented habitats within the complex, each offering fully air-conditioned comfort as well as an extensive range of features and accessories that make each habitat a private place to rest, relax and refresh amid exquisite objet d’art and historical outback memorabilia. When you and your partner want to be sociable, you can lounge by the pool or drop in at the Dune House, where facilities include a lounge, library and dining area together with a self-service open bar stocked with quality Australian and imported wines, beers, spirits and liqueurs. Style and comfort are also features at the Sails in the Desert Hotel, offering 5-star hotel accommodation at the nearby Ayers Rock Resort, which also includes a full range of accommodation options from 5-star luxury and self-contained units to budget rooms and camping facilities. The deluxe spa suites at Sails in the Desert provide an ideal sanctuary where you and your partner can unwind in the spa bath, sunbathe on your own private veranda or relax indoors amid the stylish décor. Within the resort, you will find a range of recreational facilities such as a swimming pool, tennis court and mini golf. Dining becomes an experience in its own right for guests at Sails in the Desert, who can choose from gourmet fine dining at the Kuniya Restaurant, the hotel’s signature a la carte restaurant, or the Tali Bar. When you do want to venture out, there is an excellent range of touring options that include cultural experiences, camel treks, Harley rides and 4x4 expeditions, as well as options to view and purchase quality art and crafts and visit the Uluru/Kata Tjuta Cultural Centre. While Central Australia’s most famous icon is Uluru/Ayers Rock, the world’s largest monolith, the area hosts a number of other great natural treasures, including the majestic and spectacular Kings Canyon. Set within the acclaimed Watarrka National Park, Kings Canyon is a geological wonderland featuring 300 meter sheer cliff faces, an almost mystical ‘lost city’ of towering rock formations and an ancient palm fringed waterhole. While the scenery is rugged, the deluxe spa suites at the nearby Kings Canyon Resort offer a comfortable retreat for overnight stays and couples can soak up the outback atmosphere at the gourmet Sounds of Firelight dinners that take place under the stars around the campfire. By day, visitors can put on their serious walking gear and set out on the four-hour trek around the rim of the Canyon. Take a break mid-trek and descend deep into the Canyon for a dip in the almost mystical surrounding of the canyon waterhole and marvel at the majesty of this remarkable natural phenomenon. Thrill seekers can grab a helicopter ride to get a bird’s-eye-view or visit the nearby Kings Creek Station where you and your partner can take a camel trek or an exhilarating quad bike safari. Another fabulous Outback destination to head for with your partner or a group of friends is Bond Springs Outback Retreat, an historic cattle station just 20 minutes drive from Alice Springs. Host Jan Heaslip is renowned for her gourmet homestead breakfasts, which she lays out on the vast dining table in the station kitchen. Guests can have a choice of two self-contained three-bedroom cottages or two private suites attached to the main homestead that include ensuite bathrooms, choice of one or two bedrooms and private lounge areas. There is also no shortage of stylish accommodation options in Alice Springs itself, a lively township that has a lot to offer travelers. There is a fabulous range of accommodation options from the more traditional hotel and resort style rooms and suites to more intimate and private B&Bs. Friendly hotels and resorts include the Voyages, owned by Alice Springs Resort, where upmarket clients are catered for with the River Gum rooms. The resort also hosts regular Friday evening gatherings poolside for the local “boyz and grrls” and visitors are most welcome. There is also the recently refurbished Rydges Plaza Resort, which offers five junior and two deluxe suites to cater for upmarket clientele and the hotel boasts one of Alice Springs’ best Asian restaurants, the Hanuman, which showcases noya, Thai and tandoori cuisine amid sumptuous décor. For those who are partial to flutter on the gaming tables, Lasseters Hotel Casino is the ideal venue to combine entertainment and a spot of R&R. If you prefer more spacious accommodation, Lasseters has 13 elegantly appointed executive suites with separate lounge/bar areas, and bedrooms with ensuite bathrooms and dressing rooms. Golf enthusiasts can enjoy a round at the adjacent Alice Springs Golf Course, which is rated as one of the world’s top ten desert golf courses. Alternatively you can just lounge by the pool, step out onto the tennis court or take a mountain bike ride along the great local network of dedicated bike trails. Town-based B&Bs include the stylish and centrally located Orangewood with its own private swimming pool and Nthaba Cottage, which boasts a delightful garden setting that is a haven for local bird life. Get a group of friends together or just make it a treat for you and your partner. No matter how you travel you will discover a fabulous array of unforgettable outback experiences when you take a journey into Australia’s Outback. Best of all the locals are friendly and you won’t have to compromise on any of your most treasured life comforts from top line accommodation to quality cuisine, wines and touring options.